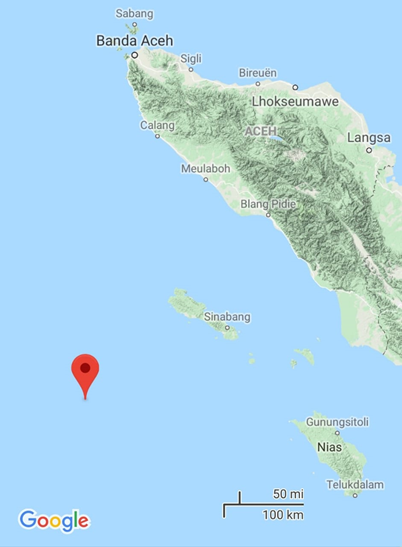 An earthquake with a magnitude of 5.3 M shocked Aceh's western waters on Sunday (27/1) at 11:36 WIB. The epicenter of the earthquake was at a depth of 10 km, located 180 km Southwest of Simeulue District, Aceh. The Head of the Volcanology and Geological Disaster Mitigation Center (PVMBG), Geologi Agency, Ministry of Energy and Mineral Resources (ESDM) Kasbani explained that the earthquake that did not cause a tsunami, because the energy is not strong enough to cause deformation under the sea. Kasbani continued that the geological conditions around the epicenter were composed of sedimentary rocks, tertiary-aged carbonate rocks, and pre-tertiary rocks. "Some of these rocks have been weathered. Rocks that have undergone weathering are decomposed, loose, not yet compact so that they can strengthen the effects of earthquake shocks," Kasbani added.